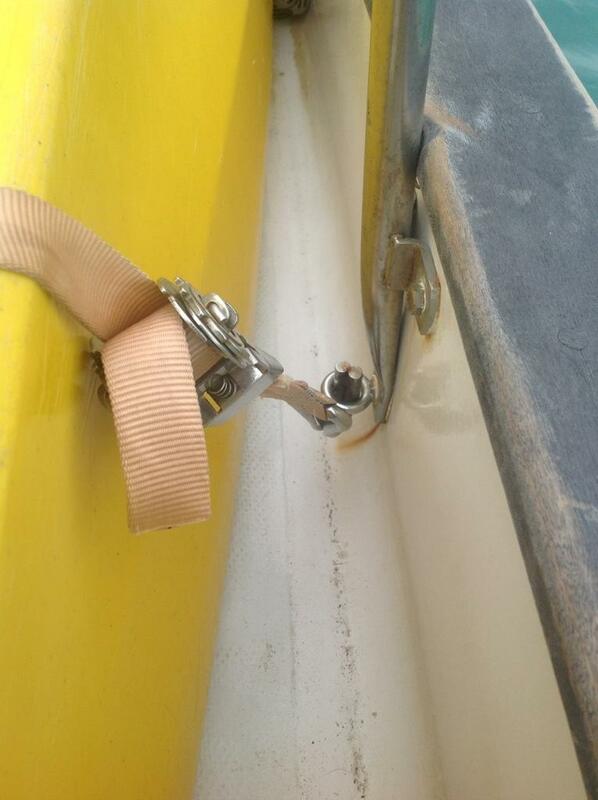 Inquiring Minds Want to Know – How Do You Securely Stow the Kayaks? Brian and I have truly enjoyed having kayaks aboard Rode Trip. We’ve shared many kayaking excisions and we are looking forward to more! The kayaks give us freedom to roam the waters separately; to surf waves, to peer into the depths, to float along shallow streams, to startle fishes and turtles, to access remote beaches and cliffs, and to exercise when long walks are not an option. But where do the kayaks live when we aren’t paddling all over the place? How do we safely and securely stow two, 12-foot kayaks atop 32-feet of deck space? Thanks to the inquiring mind of Bill, I’m happy to answer that question! 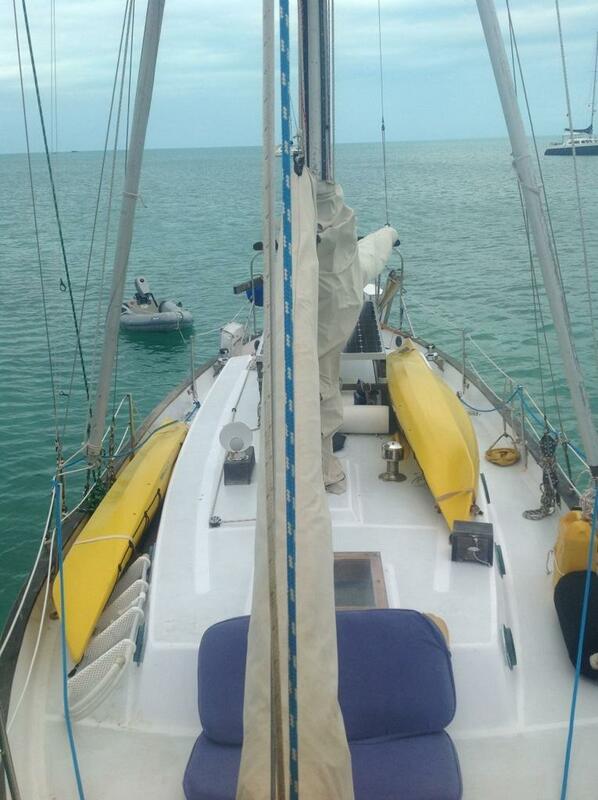 Bill and his wife, Trisha, are busy preparing their sailboat s/v Wanderer to embark on their cruising life. We have Wilderness Tsunami 120 kayaks. Both kayaks are stowed on deck; port side along the raised deck and starboard side along the walkway. Each paddle is stowed under a kayak. We’ve simply learned to maneuver on deck with the kayaks permanently in those positions. The kayaks are strapped down using ratchet straps. The ratchets are stainless steel and yes, we have spares! Brian used webbing to sew appropriate lengths of strap onto the ratchets and hooks. The ratchet straps are tightened onto lifting eyes that Brian installed through the deck; backed with washers and coated thoroughly with sealant. 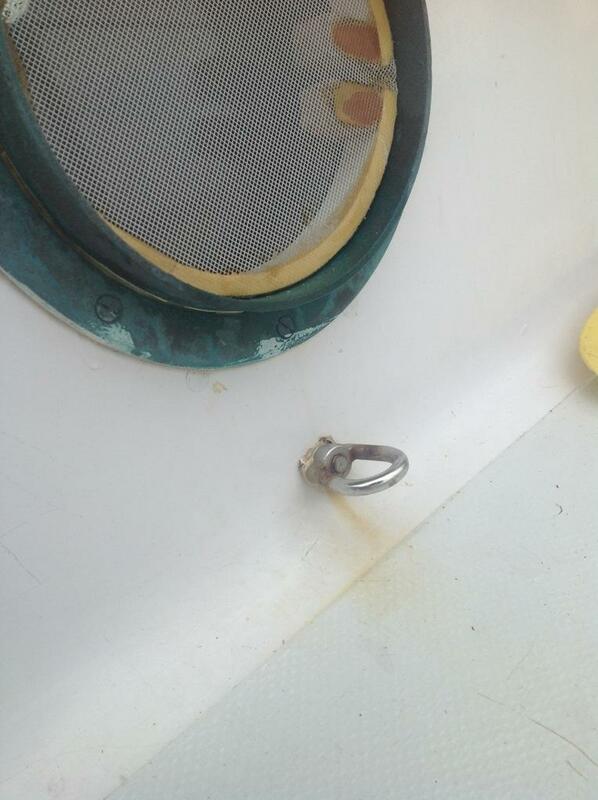 To avoid additional holes and clutter along the starboard side walkway, Brian replaced the bottom bolts of two stanchions with shoulder bolts. This entry was posted in Uncategorized and tagged kayaks, lifting eyes, ratchet straps, shoulder bolts, stow kayak on deck by stephanie. Bookmark the permalink. Another, excellent solution to having kayaks on a cruising boat is one that a friend of mine’s son has recently developed. It is a folding kayak! His website is: http://www.orukayak.com/ . He recently won the best new product of the year and best in show at a European camping show. You should take a look at this product/kayak.